If you’re using an iColor 500 or 600 and would like an even bigger envelope of applications, we have good news for you. I know it sounds crazy because an iColor laser transfer printer is already one of the most versatile digital decoration solutions on the planet. But the mad scientists in the iColor lab wanted more so they’ve added a dye sublimation option. Sublimation toner adds softer and more durable T-shirt transfers, dishwasher-safe mug transfers, better support for pastels and gradients, and easier application on hard surfaces. What exactly is sublimation toner and how does it work? Read on. For those who are unfamiliar with sublimation, here’s a quick primer. Sublimation is the process of converting something from a liquid or solid to a gaseous form. Dye sublimation converts dye based ink – or toner – to a gas that dyes polyester or polymers. Digitally printed images on transfer paper are laid on polyester apparel or polymer-coated items and heated in a heat press to temperatures around 400°F. At that temperature, the ink or toner converts to a dye and stains the molecules creating a lasting image. Traditionally this is done using an inkjet printer with a piezo-electric print head. Thermal inkjet printers can’t be used for sublimation because the heat used to jet the ink onto the paper may cause the ink to sublimate prematurely. Using an inkjet printer comes with some pros and cons. More on that in a moment. The main advantage of sublimation is the fact that color is achieved without adding anything to the substrate. The result is the softest ‘hand’ of any garment decoration technology. Sublimation on polyester garments produces vivid super-soft transfers that are extremely washfast. The other appeal of sublimation is the vast array of polymer-coated substrates that can be sublimated using a heat press or 3D vacuum press. These include stainless steel and ceramic mugs, license plate blanks, mouse pads, bracelets, cell phone and tablet covers, ceramic tiles, light switch covers…the list is endless. Please click here for a more detailed introduction to sublimation. So what exactly is sublimation toner. You could say it ‘s the same thing only different. Or you could say it’s an idea that’s been years in the making that has finally come to market. Both statements are true. In a nutshell, the iColor sublimation toner solution works the same way as inkjet sublimation, but without the ink. Fig 1: Here’s where you select the ICC Profile. Click thumbnail for larger image. There is a specific ICC Profile supplied to produce vivid, correct color. This one works a little differently from the CMYK and CMYW profiles used in the iColor TransferRIP software. 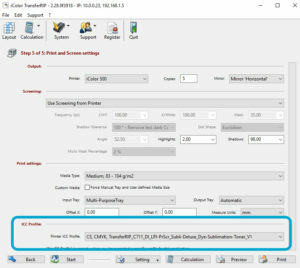 Just download the sublimation profile, right-click on it in Windows Explorer and, from the fly-out menu, select Install Profile. 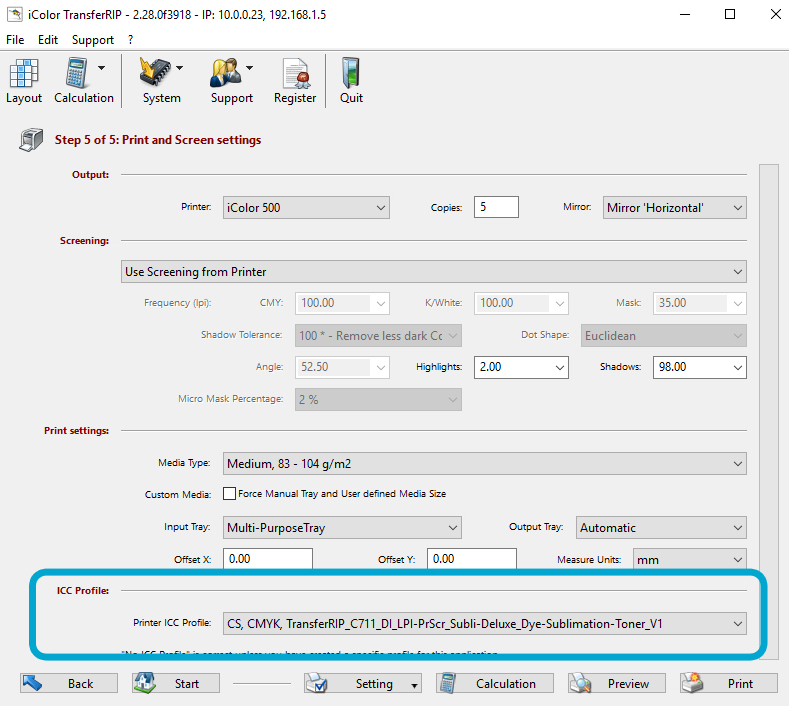 Use the CMYK import profile in iColor TransferRIP and select the Sublimation ICC from the output profile window at the bottom of the print page (Fig1). You can and use the sublimation output profile to print directly from Adobe Photoshop. You can download the profile in a zipped folder from our Technical Support Blog. The iColor sublimation toner set consists of the standard CMYK process colors. The kit includes both toner and drum cartridges that can be inserted into the printer just as quickly as the swap from Black to Fluorescent White in the standard iColor 500 & 600. The toner and drum cartridges are shipped separately so some assembly is required. Open the box, unseal the toner cartridges, lock them onto their respective drum cartridges, and insert them into your iColor printer. Badda bing, badda boom, you’re ready to print. 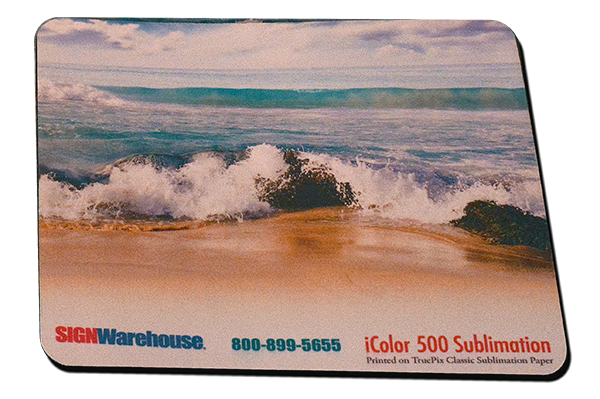 The iColor 500 sublimation toner kit costs $1,595.00 and includes enough toner to output around 5,000 prints*. The iColor 600 toner sublimation kit is yours for $1,795.00. So how does sublimation toner compare to good old sublimation ink? How does it compare to standard laser transfer processes? As one might expect, there are pros and cons on both sides. Here’s a summary. Softer transfers: As noted above, sublimation is the softest of all digital garment decoration technologies. The same is true with toner. Shirts decorated with sublimation toner are noticeably softer than those done with laser transfer paper. Faster Print Speed: LED Laser printers are much faster than inkjets. The iColor 500 can crank out 1200 x 600 dpi prints at speeds up to 34 pages per minute. A comparably sized sublimation inkjet printer is measured in pages per hour. If you do the math, the iColor can print over 2,000 pages per hour vs. 157 for an inkjet printer. Simpler: Decorating a white polyester shirt with sublimation toner is simpler and easier than doing so with self-weeding laser transfer paper. Sublimation is less sensitive to slight variations in pressure and temperature so it’s easier to get consistent color. Economical: Despite the price of entry, toner is much more economical than ink. Because of the enormous yield from a set of toner cartridges vs. ink cartridges, sublimation with toner is much more economical than sublimation with a desktop inkjet solution. Sublimation transfer paper is also more affordable than laser transfer paper. Sublimation toner really gives you the best of both worlds. You get the cost savings of toner vs. ink plus the cost savings of sublimation transfer paper vs. laser transfer paper. (It’s actually better than that because you can use standard copy paper if you like). Here’s how the three options stack up, based on manufacturer estimates. The total ink and paper cost for an 8.5″ x 11″ print from a desktop inkjet sublimation printer is about 94 ¢. The total toner and paper cost for a transfer using one-step self-weeding laser transfer paper is about 81¢. The total toner and paper cost for a transfer using sublimation toner and sublimation transfer paper is about 41¢. Washability. Sublimation is one of the most durable of all garment decoration methods. Your toner-sublimated shirts should last well beyond 100 wash cycles. Laser transfers using one-step self-weeding papers are generally rated for about 35 wash cycles. Standard caveats apply. Wash inside-out in cold water. Avoid bleach and harsh detergents. Likewise toner-sublimated mugs are more washfast than those decorated with laser transfer paper. They’re dishwasher safe and don’t have to be oven-cured. Just print, press, peel and rinse. The process for decorating a polymer-coated mug with sublimation toner is almost the same as inkjet sublimation, but it takes less time. More on that below. Fig 2: Sublimation transfer paper supports pastels and gradients better. Better Pastels and Gradients: Sublimation transfer paper handles gradients and pale hues better than self-weeding laser transfer paper. Self-weeding laser transfer paper doesn’t ‘read’ pale hues and color-to-white gradients well. There’s no such problem with sublimation toner. So if you need to do a transfer on a white shirt or substrate that includes light pink, other pastel colors or gradients, you’ll get better transfers in these areas with the sublimation toner option (Fig 2). White and Pastel substrates only: Since there is no White sublimation toner, this solution has the same limitation as inkjet sublimation. You can’t dye dark surfaces. This is a solution for decorating white and pastel apparel and white and gray scale substrates. Polyester and Polymer-coated: As noted above, sublimation only works on polyester or polymers. Toner is no exception. So you’ll have to use 100% polyester for vivid, durable garment transfers and polymer-coated blanks and mugs for your hard surface decoration. This means you can’t use sublimation toner to decorate black cotton shirts or black uncoated dollar store mugs. For those applications, you can use your standard CMYW toner cartridges and laser transfer paper. Residue. The toner leaves some visible residue on hard surfaces. This can be cleaned off at any time using UniNet SCTD cleaning solution. If you see what appears to be color coming off with the residue, don’t fret. The toner is just a carrier for the dye. The sublimated image remains intact. Hopefully you’re beginning to see the benefits of that expanded envelope and are ready to add a sublimation toner kit to your iColor print system. As is the case with any new technology, there will be some things to figure out and adapt to your production environment. Here are a few tips to help get you started. Use Paper, Not Teflon: Sublimation has a tendency to bleed through polyester shirts. If you place your transfer paper on the shirt with nothing below the shirt and nothing between the transfer paper and the heat press, you may accidentally sublimate your heat platen and the table. To prevent this, place a sheet of copy paper under the shirt and another over the sheet of transfer paper. Discard these after each transfer. This is standard procedure for inkjet sublimation. Don’t use Teflon sheets (link). You may accidentally sublimate the Teflon and transfer a ghost image to the next thing it touches. Peel it hot. We tested with True Pix Classic Sublimation transfer paper. The toner does have some tack to it, so this is a hot peel process. When you pull your mug or mouse pad from the press, you need to remove the paper as quickly as possible. Otherwise, the toner will fuse the paper to the substrate as it cools. For mouse pads, this is not a problem. Just flip it over and peel the paper from one side to the other. Leave a Peel Tab on the Paper: In order to peel the paper hot, you’ll need to be able to grab it quickly. With mugs, you’ll need to cut your paper with a blank area outside the toner so it’s easier to grab that edge and peel the paper back along the surface of the mug (Screen cap) . If you use heat tape, you can use the tape to start the peeling and easily remove the paper. This means you may not be able to do a full wrap mug design as easily. And you wont’ be able to nest your prints as closely as you would with inkjet sublimation. But since toner and sublimation transfer paper are so economical, your added toner and paper cost are negligible. Mug settings: For best results use an EnduraPRESS MP5 Mug press and press at 305°F for 3 minutes. Sublimation toner isn’t as pressure-sensitive as laser transfer paper, so you don’t need as much pressure to get a good transfer. Immerse the mug in cool water as soon as the paper is removed to stop the sublimation process and get a crisp image. Our results with this process were very comparable to those obtained using SubliJET HD ink. So there you have it. The addition of sublimation toner adds simplicity, durability and ease of use to the long list of benefits for laser transfer decoration. Adding the sublimation toner kit will give you softer, longer-lasting T-shirt transfers. You’ll also have a faster, more washfast solution for decorating polymer-coated mugs. You may also find your mouse pad and metal blank transfers are more forgiving. And finally, the sublimation toner option produces better looking transfers for pastel hues that challenge self-weeding laser transfer paper. There are some limitations, but the benefits are well worth considering. Questions or comments? Scroll on down and send ’em my way. *5,000 image cartridge yield estimate is based on standard ISO page with 20% coverage. Your mileage may vary.